Teams consist of 2 players. You will play 3 full games of Euchre per night, vs 3 other Teams. We will determine playoff/tournament for the end of week schedule based on seeding. You will earn 3 outcomes per night for record, so if you win 2 and lose 1, you will be 2-1 for that week. Standard Euchre rules. Rules will be posted ASAP. 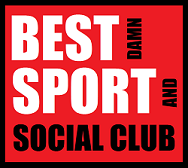 Check out this Euchre league 'Thursday Euchre (Spring) 2019' with Best Damn Sport and Social Club!